Metal thread embroidery – usually referred to as goldwork, even if using metal threads of different colours – has been used for centuries for rich and spectacular embroideries. It has the twin advantages of being very impressive visually, and relatively quick to do, covering a background fabric far faster than split stitch, for example. 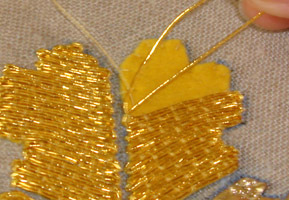 Traditionally used in ecclesiastical embroideries, contemporary goldwork uses ancient techniques to new and stunning effect. 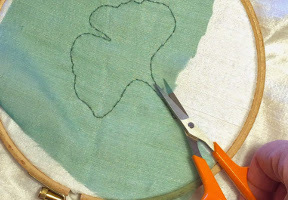 Cut out a shape from felt in the shape to be worked in metal thread. This is commonly yellow felt for goldwork or white or pale grey for silver. 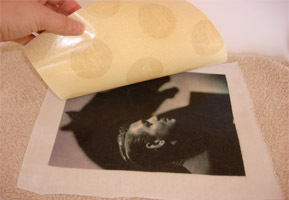 To give a raised effect, use several felt layers. 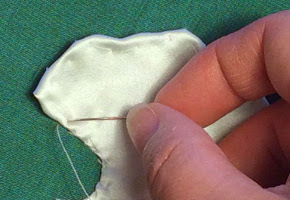 Lay the metal thread on top of the felt shape, starting at the edge. Leave an end of about 1 inch (2.5cm) for finishing off later. 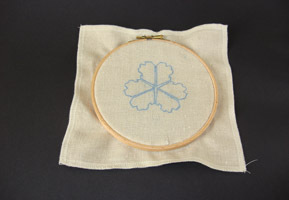 Using the sewing thread, make a small straight stitch over the metal thread, attaching it to the background fabric. 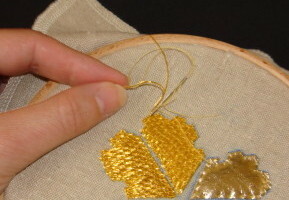 Continue to stitch the metal thread down at intervals of about a quarter of an inch (about 0.5cm). 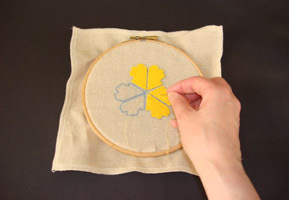 Couching – fastening down one thread laid across a fabric with stitches in another – really is that easy! Of course, to get interesting effects takes additional techniques, such as couching with colour and or nué, but they’re still very simple. Different effects can be obtained by couching in concentric bands, or backwards and forwards, giving a brickwork effect. When cornering in a brickwork pattern, the lower thread of the two in the first row should also be the lower in the second row, i.e. it should cross over the upper thread. This gives a neater corner. There are a range of commonly used metal threads and wires, appropriate for different finishes. At the top end of the market, for prestige projects, are genuine gold threads; for most of us, however, imitation gold works just as well. 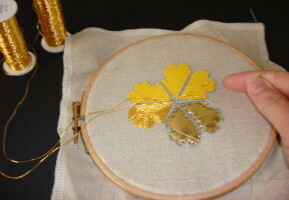 In fact, as the imitation gold threads won’t tarnish while the real gold ones will, they’ll look good for longer. There are two main kinds of thread: passing threads and purls. Passing threads consist of a fine metal foil wrapped around a thread core, while purls are tightly coiled wires with a hollow core. Possibly the commonest passing thread in popular use today is Japanese thread, often referred to as Jap or imitation Jap, which is a gold or silver coloured base metal foil wrapped around a thread core. It comes in a range of thicknesses, and is very effective when couched. The highest quality gold threads are 2% WM smooth passing threads; these are 2% gold on a white metal (WM, or silver-plated copper) base, on a thread core. 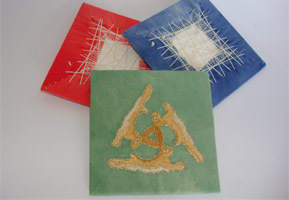 Gilt smooth passing threads are similar, but are ½% gold. Passing threads are commonly couched, singly or double. There are different sorts of purls, divided loosely into ones with smooth or textured surfaces. Rough and smooth purls are both smooth, but rough purl has a matte appearance while smooth purl is polished. Of the textured kinds, pearl purl (or jaceron) has a rounded finish, like a string of tiny beads or pearls, while bright check purl has an angular, faceted finish, which catches the light. Pearl purl is particularly versatile; it can be couched as it is, or stretched to form a spiral wire. All purls can be cut to short lengths and used like beads, or cut to longer lengths and secured to a background fabric with a thread passed through the hollow core. Pearl purl can also be couched; stretching it slightly and couching in a coloured thread between each ‘pearl’ can be very effective. When couching passing threads, you can use either a single thread, or two threads laid side by side. To minimise waste, instead of cutting lengths of thread from the reel to couch, keep the thread on the reel or reels, unspooling it as you go, only cutting once you reach the end of the part of your design you’re working on. To start off, leave an end of about 1 inch (2.5cm); place your first stitch at the point where you want the finished couched thread to start. Similarly, when you’re finished, cut the couched thread, leaving an end of about 1 inch (2.5cm). These ends can now be taken through to the back of the fabric, using a thick needle with a loop of sewing thread through its eye. Push this needle part way through the fabric at the point where you want the end to go through. Lasso the end of the passing thread with the thread loop, and pull the thick needle completely through the fabric. 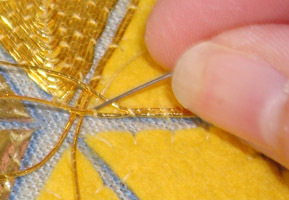 The end of the passing thread will be pulled through to the back, where it can be stitched neatly in place and trimmed. Texture and contours can be created by couching over shaped or raised areas formed with soft string, or shapes padded with felt. Experiment with the spacing of the couching stitches. 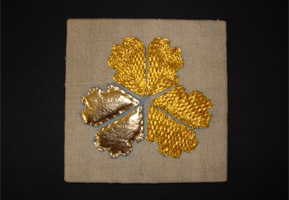 A goldwork piece can be embellished with beads, sequins or spangles, or gold or silver kid leather.